The insurance industry is constantly in need of people. It can be difficult to find personnel for all your staffing needs. That makes it even more important to employ eligible, reliable candidates. If you skip the background screening process, you may hire someone who is not qualified to represent your company and end up terminating their employment. This leads to yet another time-consuming hiring phase. Reduce the hiring issues you already face by properly screening people before extending offers. When a customer calls their insurance agent, they've probably endured a difficult or painful experience. Insurance professionals work with people who were involved in accidents, victimized by criminals or subjected to personal loss. Your customers count on their representatives to be knowledgeable, credentialed individuals who can help during difficult times. We provide Credential Verification services that ensure your applicants are qualified for the job. Are You Taking Unnecessary Hiring Risks? Hiring someone without a background check can cause multiple issues. You could hire someone who is not qualified, does not have a necessary license or has a serious criminal record. Thoroughly screening candidates before making a final offer is paramount. 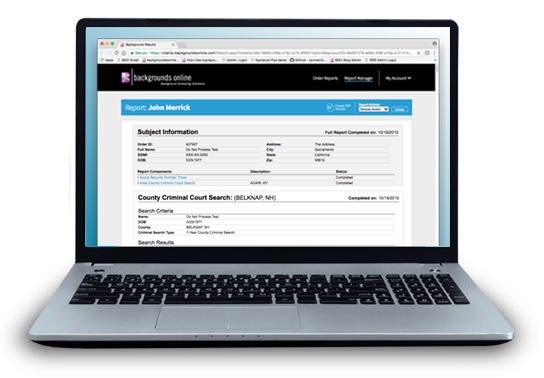 Backgrounds Online confirms identities, verifies education, licenses and employment, and notifies you of reportable criminal records. You can also request a Employment Credit Report for relevant positions, in order to learn about the applicant's financial history. Your office may have urgent hiring needs. You might be inclined to rush the background screening process and make faster hiring decisions. But if you take shortcuts, like using an applicant's social profiles to decide whether or not to extend an offer, then you run the risk of breaking FCRA regulations. It is essential to only utilize FCRA compliant screening methods for hiring purposes. Backgrounds Online has many years of experience. We are FCRA certified and we do everything possible to stay educated on current and new regulations. Don't take risks during your hiring process. Partner with us for authoritative, expeditious and fully compliant background screening services. I have several job openings – how do I find qualified people? A: The best way to find qualified people is with a customized, industry-relevant background check. We'll help develop screening packages that are ideal for you hiring needs. This starts with important verifications, including identity, education, employment and credentials. This information shows you immediately if a candidate meets all of your eligibility requirements. People may pad their resumes to get the job they want – our verification service empowers you to know for sure. Do I need to screen people who apply for administrative positions? A: We recommend background checks for every employee. There are several reasons for this. Fairness. You cannot show favoritism in the hiring process. The best way to be fair is to screen every employee equally. Backgrounds Online helps you create screening packages that are tailored to each job type. You can save those packages and use them again for future hires. Compliance. There are numerous FCRA and state regulations that must be followed throughout the hiring process. One of the most important involves obtaining background information from a Consumer Reporting Agency (CRA). It is not legal to obtain background information via Google searches or social media. Risk. If you do not follow regulations that govern the hiring process, you are breaking federal and/or state laws. The best way to avoid these risks is by obtaining valid background checks for every potential employee from a CRA. Competition is fierce and my hiring process takes too long. Can you help? A: Yes. Backgrounds Online helps you develop the quickest and most efficient hiring process possible. By collecting the facts about someone's past, we help build a more complete picture of each applicant. That empowers you to quickly go through them and see who is fully qualified and who is not, which in turn can lead to a shorter, faster hiring process. Running authoritative, compliant background checks gives you an edge. This allows you to screen each candidate in the shortest time possible so you can make offers to qualified applicants before they get them somewhere else. Do you offer ongoing drug screening services for insurance personnel? A: Our partner, Quest Diagnostics, provides comprehensive drug screening services. We can help schedule potential new employees for their initial screening, and also set up annual screenings for your current personnel. Choose from a 5, 10 or 14 panel package. For more information, contact our knowledgeable staff today. When hiring for the insurance industry, you must move quickly while remaining fully compliant and following all relevant regulations. Backgrounds Online provides fast results that can legally be used for hiring purposes.